Wilson may still look a little disgruntled, but the cat with the sad face at the Nanaimo SPCA has plenty of reasons to smile these days. Arriving in BC SPCA care via the city’s animal control, Wilson was found as a stray, in rough shape from living life on the streets. Now, his skin is slowly clearing up and he’s being treated for fleas, multiple abscesses, rotten teeth, ear and head trauma, and more. “His dental surgery has been booked and he’s eating up a storm,” says Nanaimo BC SPCA Branch manager Leon Davis, who notes that an appeal for help covering Wilson’s medical costs was successful within five days. With an adoption pending, Wilson may have a happy ‘fur’ever home soon, Davis says. Little old man Wilson has eyes that could melt even the coldest of hearts. 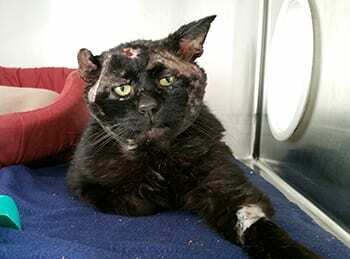 The black, short-haired cat arrived at the Nanaimo BC SPCA Branch after being picked up by the city’s animal control, after evading previous attempts to catch him made by residents. And his unhappy mug could easily make another chapter in Sad Cat’s Diary, a popular YouTube video. Branch manager Leon Davis says despite his rough life as a stray, staff are guessing that at one point, Wilson had a guardian, because he enjoys being petted and held and is in no way feral. He’s estimated to be about seven years old. Wilson has a host of issues from living on the street for so long, including fleas, ear mites, multiple abscesses, rotten teeth and some swelling and trauma to his ears and head from being attacked at some point. 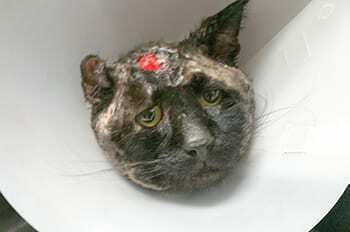 He will also require a special hypoallergenic food to help treat a skin condition. His care is expected to cost about $2,950 and his recovery could take up to two weeks. A non-profit organization, the BC SPCA relies primarily on public donations to help the province’s neglected, injured, abused and homeless animals. If you can help Wilson or animals like him in need at the Nanaimo Branch, visit spca.bc.ca/medicalemergency or drop off donations in person 2200 Labieux Road, Nanaimo, B.C.